Both things happened almost on the same day. On the one hand the publication in the “Acta Apostolicae Sedis” of that which is presented as the official and definitive interpretation of the controversial eighth chapter of “Amoris Laetitia,” in favor of communion for the divorced and remarried. 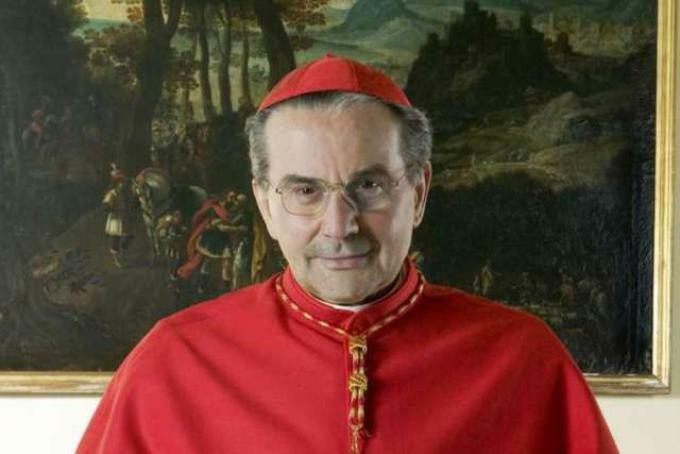 On the other the release of a book with homilies and texts by Carlo Caffarra, one of the four cardinals who submitted to Pope Francis their very serious “dubia” precisely on that chapter. News of the first of these two publications came in early December, when the new volume of the official “Acta” of the Holy See came off the presses. But the decision to print in it the letter in which the pope approves the criteria adopted by the bishops of the region of Buenos Aires for the application of the eighth chapter of “Amoris Laetitia” dates back to six months before, to June 5. That was, in fact, the day on which Francis gave the order to Cardinal Pietro Parolin, secretary of state, to proceed with the official publication of both of those documents, the pope’s letter and the text of the Argentine bishops, “velut Magisterium authenticum,” as authentic magisterum. 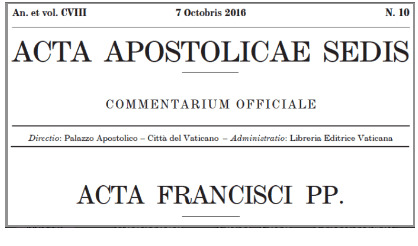 Summus Pontifex decernit ut duo Documenta quae praecedunt edantur per publicationem in situ electronico Vaticano et in “Actis Apostolicae Sedis”, velut Magisterium authenticum. The two documents have been published in Spanish, their original language, with the pope’s letter placed first and bearing the title and qualification of “Epistula Apostolica,” followed by the text of the Argentine bishops, presented as “Additum ad Epistulam,” meaning an attachment to the papal letter. This last sentence, however, raises a few doubts. If that of the bishops of the region of Buenos Aires is truly the only interpretation admitted by the pope, then what becomes of the solemn affirmations also written by the pope in the opening of “Amoris Laetitia,” according to which it is right that there should exist “various ways of interpreting some aspects of that teaching or drawing certain consequences from it,” so that “each country or region can seek solutions better suited to its culture and sensitive to its traditions and local needs”? What would become, for example, of more restrictive interpretations, like that of the Polish bishops or of the archbishop of Philadelphia, Charles Chaput? Or vice-versa, of more expansive interpretations, like that of the German bishops or of the even more reckless bishop of San Diego, Robert McElroy? Should they all be corralled within the criteria established by the Argentine bishops, because after all “there are no other interpretations”? But even in Argentina, was it not perhaps going beyond the prudential criteria of his confreres of the region of Buenos Aires when the bishop of Reconquista, Ángel José Macín, publicly and collectively celebrated, in the cathedral, the return to communion of thirty couples of divorced and remarried persons who continue to cohabit “more uxorio”? And again. Neither is it by any means clear what “authentic magisterium” means as applied both to the “apostolic letter” of Pope Francis and to its attachment. Nor is it clear how this act of “magisterium” can be reconciled with canon 915 of the code of canon law that forbids communion for those who “obstinately persevere in manifest grave sin.” Doubts have been raised on both of these points by a talented canonist like the American Edward Peters. But getting back to June 5, the day on which Francis ordered the publication of the two documents among the official proceedings of the Holy See, it can be noted that on that date the pope had had on his desk for a month the heartfelt letter in which Cardinal Caffarra asked him for an audience together with the other cardinals of the “dubia,” which he resubmitted intact. As is well known, neither the “dubia” nor this letter have ever received a response, nor can the publication of those two documents in the “Acta Apostolicae Sedis” be seen as one. Caffarra died on September 6, and even after then the pope has held himself back from any sign of esteem for him, even on October 1 when he went to visit Bologna, the diocese of which the deceased cardinal was archbishop from 2003 to 2015. The author of the article, Emanuela Ghini, is a discalced Carmelite nun, highly esteemed for her writings on Sacred Scripture and spirituality. A few months ago there came out in bookstores a very interesting correspondence, spanning half a century, between her and the theologian and then cardinal Giacomo Biffi (1928-2015), Caffarra’s predecessor as archbishop of Bologna. The preface to the correspondence between Biffi and Emanuela Ghini is by Caffarra himself, a close friend of both. Here is another book not to be missed, together with the one released in recent days with the homilies and texts of the cardinal. One page of which is reproduced below. It couldn’t be more timely. The alternative to a Church without doctrine is not a pastoral Church, but a Church of whim and enslaved to the spirit of the time: “praxis sine theoria coecus in via,” as the medievals used to say. This is a serious snare, and if it is not overcome it causes great damage to the Church. For at least two reasons. The first is that, since “Sacra Doctrina” is nothing other than the divine Revelation of the divine plan for man, if the Church’s mission is not rooted in this, what is the Church saying to man? The second reason is that when the Church does not protect itself from this snare, it is in danger of breathing the central dogma of relativism: when it comes to the worship that we owe to God and to the care we must have for man, it does not matter what I think about God and about man. The “quaestio de veritate” becomes a secondary question. The second snare is to forget that the key to the interpretation of all reality and of human history in particular is not within history itself. It is faith. Saint Maximus the Confessor maintains that the true disciple of Jesus thinks of everything in Jesus Christ and of Jesus Christ in everything. Let me give a very timely example. The ennoblement of homosexuality, which we are witnessing in the West, must not be interpreted and judged by taking the mainstream of our societies as the criterion; or the moral value of respect that is due to every person, which is “metabasis eis allo genos,” changing the subject. The criterion is the “Sacra Doctrina” on sexuality, marriage, sexual dimorphism. Reading the signs of the times is a theistical and theological act. The fourth snare, closely connected to the previous one, is the reduction of the Christian proposal to moral exhortation. It is the Pelagian snare, which Augustine called the horrible poison of Christianity. This reduction has the effect of making the Christian proposal very tedious, and repetitive. It is only God who in his action is always unpredictable. And in fact at the center of Christianity stands not the activity of man, but the Action of God. The fifth snare is silence on the judgment of God, through a preaching of the divine mercy made in such a way that it is at risk of removing from the conscience of the man who listens the truth that God judges man. The second concerns Cardinal Biffi. In addition to the correspondence with Emanuela Ghini, another valuable book of his has been released posthumously this year, “Things new and things old,” published by Cantagalli, which collects his pastoral texts between 1967 and 1975, when he was a parish priest in Legnano and Milan.